Providing a clear, concise treatment of the essential topics addressed in a modern engineering design graphics course, this text concentrates on teaching hand-drawing as a skill and a vital component of the design process. Unlike texts that reduce drawing to a computer-based task, Leake and Borgerson's book emphasizes the role of sketching in conceptualizing a design solution. This reflects the growing trend in engineering graphics courses, in which hand-drawing is used for developing a design and computer tools are used for the final iterations. By providing a brief, skills-based approach, this reasonably priced volume - which includes several hundred sketching problems - is well positioned to offer a compelling alternative to the large volumes by Giesecke and Bertoline. 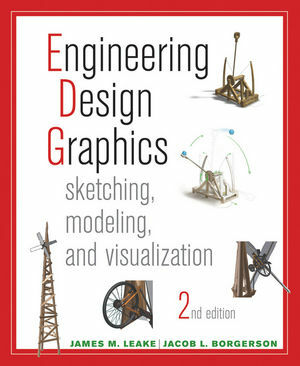 Alongside its coverage of hand-drawing skills, this text also provides a chapter on computer-aided design software, with an emphasis on parametric solid modeling. Professor James M. Leake teaches in the Department of Industrial and Enterprise Systems Engineering at the University of Illinois.? Professor Leake served as a naval architect in the Pacific Northwest for 10 years and is a registered engineer in naval architecture in Washington. His current research interests include engineering education, integration of CAD/CAE software in the engineering curriculum, spatial visualization, and reverse engineering. • Worksheets for drawing problems have been moved from end of the book to end of chapters, so students can create practice drawings adjacent to the problem statement. • Emphasizes hand-drawing as a key component of the design process. • Teaches sketching as a means to help students "think in 3 dimensions"